Hear ye! Hear ye! This just in! 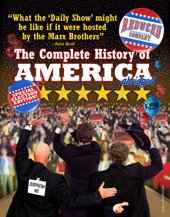 The Special Election Edition of The Complete History of America (abridged) is coming! The show has been performed at the Kennedy Center, the Lincoln Center and many other centers not named for dead Presidents. It ran for almost ten years in London. Heck, we’ve even performed it at theWhite House! And now it’s coming to a theater near you. Here’s a sample of the comic mayhem. And here are the venue details. Episode 304. Welcome Back Dustin →← Happy Merry Chrismakwanukkahanzakah!